Dermaplaning is a safe and highly effective physical exfoliation procedure that removes the top-most layer of dead skin along with fine vellus hair (aka peach fuzz). The procedure can be performed monthly, in less than thirty minutes, with no downtime post-treatment. Temporary removal of “peach fuzz” covering the face, leading to more vibrant and even skin tone and texture. Hyperkeratosis reduction. Dermaplaning will reduce the build-up of dead surface skin that causes acne. After cleansing your face, the surface layer of dirt, oil, and dead skin cells will be carefully scraped off by the skin care specialist using a sterilized surgical scalpel. After the procedure, clinical products specially selected for your skin will be applied by the specialist. Will my hair grow back thicker, faster, or darker? No, the procedure does not trigger hair follicles so your hair will return as it was before the procedure. 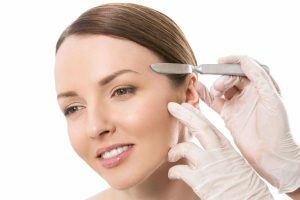 Who is the best candidate for dermaplaning? The procedure is recommended for anyone that wishes to have smoother, healthier looking skin. However, it is not advised to those with acne. Dermaplaning is performed on the face only. Can dermaplaning cause the skin to bleed? Similar to shaving, dermaplaning can cause the skin to bleed due to a sharp blade being used to perform the procedure, but the chance of that happening is rare. How often can this procedure be performed? Dermaplaning will remove about 3 weeks worth of dead surface skin cells so it is best to wait around 3 to 4 weeks between procedures. There is no recovery time associated with the procedure, you will not leave with red or irritated skin. Make-up and other facial products can be applied immediately following dermaplaning. When performed by a licensed and experience aesthetician there is no more danger in the procedure than there is when a man shaves his face.